Zoe Lehmer is a horse trainer and farrier working out of Indiana. As she prepares to make a move to the great ole State of Texas, we invited her for a two week visit to do an evaluation of our herd. We love consulting folks with a fresh look on our four-leggeds, and her work solo with our fur babies as well as alongside our very talented and beloved current farrier gave us food for thought. Zoe is a horse lover herself, and so we of course invited her to tag along on some trails during her stay. Lucky her, we let her ride the newly broke naughty pony. It was, truly, our pleasure (har har!!). Here’s a reflection of her experience with our trails. Enjoy! The two weeks that I spent at Maverick Horseback Riding are two weeks that I will always remember and never forget. Maverick Ranch is both for the beginner riders and experience riders. The horses at “Maverick? Equestrian Stables” are like no other trail riding horses out there. They don’t just follow the path or the horse in front of them, they actually have to be controlled and steered in the correct direction. If you are a first time rider or a rider with very few riding hour, I would definitely recommend the need to listen to every word that your trail guide gives. They don’t want you to put yourself or the horse in harm’s way by incorrectly generic arcoxia 90 mg queuing the horse that you are on. Listening to directions is key. If you do feel yourself getting nervous or frustrated while trying to steer the horse don’t worry, the guides can always pony you along so that you can enjoy the ride without any worries. Every horse has his or her own little quirks. With this being said it’s very important for the rider to have a little bonding time before the trail riding begins. Joan Marie has made it her duty to achieve this bond before letting anyone hop on their horse and ride. She has accomplished this in the way of engaging all riders in brushing and tracking up the horses. Maverick Horseback Riding Equine Tours is a very hands-on experience for the whole family! One of my favorite rides would definitely be the BBQ ride. You get to enjoy a ride with beautiful scenery and the best BBQ around from Black’s BBQ of Lockhart and Austin, TX. Life couldn’t get better then that! If you get the chance to visit the great town of Lockhart you must go for a trail ride at Maverick Horseback riding! If you would like to inquire about a rebate on portions of your trail, please contact us. 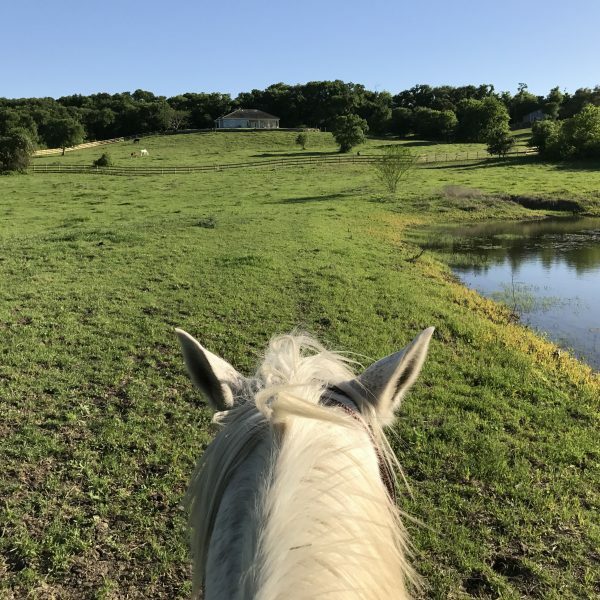 We love to hear back about your experience, and certainly love to hear about what you are looking forward to seeing improved, added and changed for your next visit to our Texas Dude Ranch.